Thanks so much for this jewelry cleaning product review, Louanne. I was not aware that there was a 'home' DIY alternative to cleaning jewelry instead of having to take them to a jewelry store and pay someone else to clean treasured items. I can well imagine how pleased your daughter was with her earrings with a 'family history'. My daughter, on her wedding day just before she walked down the aisle with her dad, was given a small pinky ring that had been in his family for a long time. He thought it was perfect for the 'something old'. She was so thrilled that she wears it every day (along with her wedding ring, of course!). It is very special to her. First, congratulations to your daughter on her graduation! What a wonderful gift too. Passing down a family heirloom is entrusting her with a real treasure. I'm sure she will cherish the earrings forever. 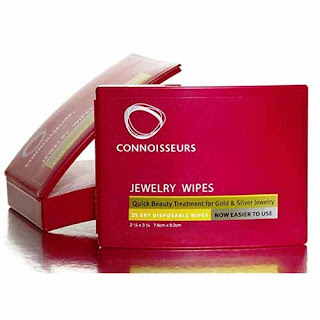 Now, about the jewelry cleaning wipes. I had not heard of them before. I couldn't help but glance at my own gold wedding ring and consider how it might appreciate some attention, as well as some of my other jewelry. I would much rather clean my own jewelry and I certainly appreciate this recommendation. Good to know. I don't wear a lot of jewelry so it tends to loose it's sparkle quickly. I don't even think about it until I need to wear it, so these would be a great thing to have around. When I need a piece I can make sure that it is clean and sparkling as it should. Thanks Louanne! I've never heard of these, excellent tip. I'll have to try them. Would love to try these - sounds like a great DIY!